The vision actually was born more than a decade before its realization. A sketch was found in the Archives dating from 1947 of a round church to be built on the site that Founder’s now occupies. Why it was not built then is not known. It is speculated that the post war residential building boom may have made materials and workers in short supply. Ernest did spiritual mind treatment for each phase of construction and then went back to the Institute to do fund raising for the completion of Founder’s. 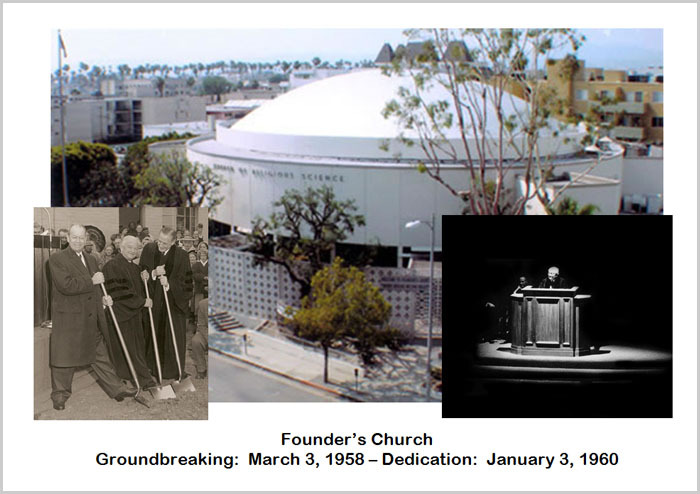 This, then, is the legacy of Dr. Ernest Holmes to Founder’s Church.